Behold, NHMUK R5161: the extraordinary holotype of Scolosaurus cutleri. 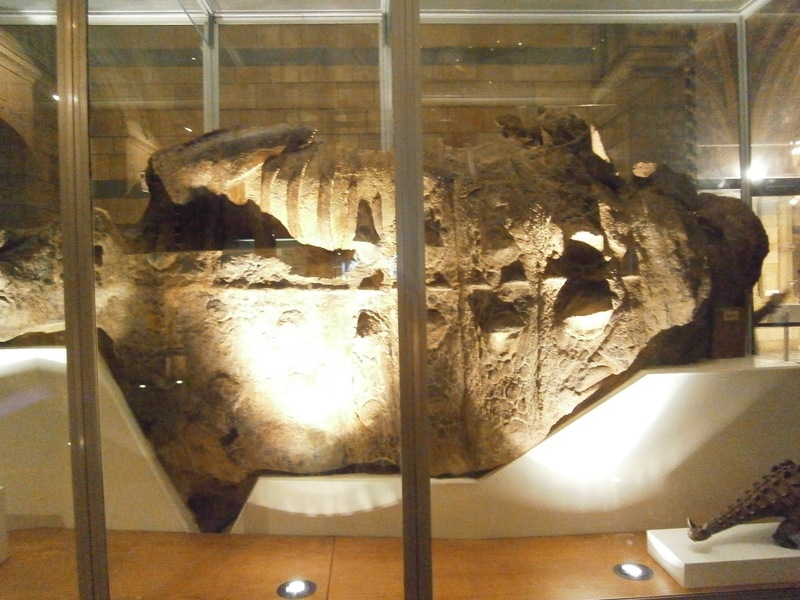 This is truly one of the most amazing dinosaur fossils that has been collected from Alberta, and is one of the best preserved ankylosaurs in the world. And the best part is that it is on display for everyone to enjoy in the galleries of the Natural History Museum in London. The holotype of Euoplocephalus isn’t very complete, as holotypes go. So, one of the first things I had to figure out for this project was whether or not the holotype of Euoplocephalus had any diagnostic features. Euoplocephalus was certainly unique when it was named – no other dinosaurs had the pattern of flat, polygonal plates on the skull like CMN 0210 has, and Lambe wasn’t even entirely sure what the cervical half ring was (he suggested it might have been the back of a frill or crest). Here it is again: CMN 0210, holotype of Euoplocephalus tutus. A lot of times, features that are unique or diagnostic to a species when it is named are later found to be present in other closely related dinosaur species. There’s a great term for this – character obsolescence (Wilson and Upchurch 2003). Anodontosaurus, named by Sternberg in 1929, had similar flat polygonal plates on the skull. And although Ankylosaurus was named in 1908, a skull was not known for some time – but it too has flat polygonal plates on the skull. So, this pattern isn’t necessarily a diagnostic or unique feature for Euoplocephalus. Paul Penkalski looked at variation of skulls referred to Euoplocephalus in 2001, and noted that there were a couple of different morphologies represented by cervical half rings. Is the cervical half ring of CMN 0210 unique? 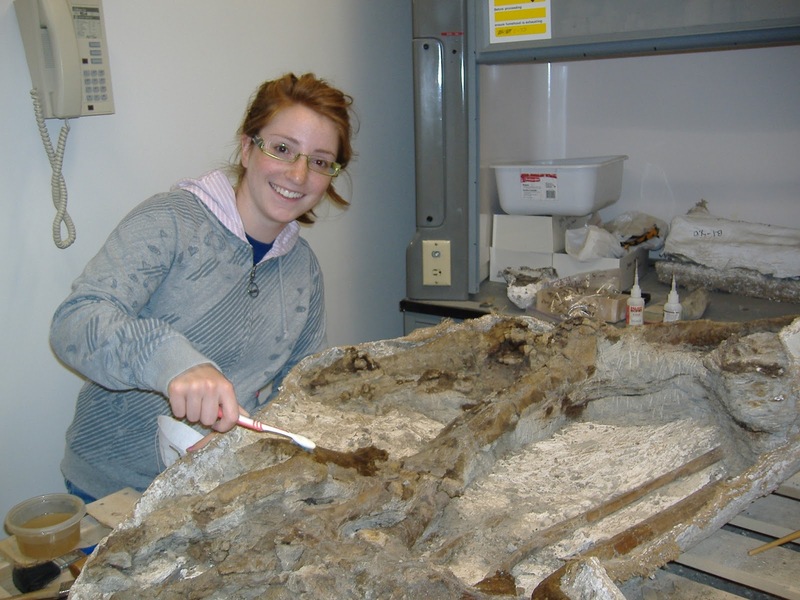 Luckily for me, the University of Alberta has an excellent ankylosaur specimen called UALVP 31. Collected by GF Sternberg in 1921 and described by Gilmore in 1923, the skull has been on display in our paleontology museumfor several decades. And here’s UALVP 31’s skull on display, plus the tail club UALVP 16247. But more than the skull was collected – the cervical half rings, part of the hips and leg, a scapula, and other bits and pieces had been collected but never prepared! So, I dug out the half rings and other pieces and got to work. 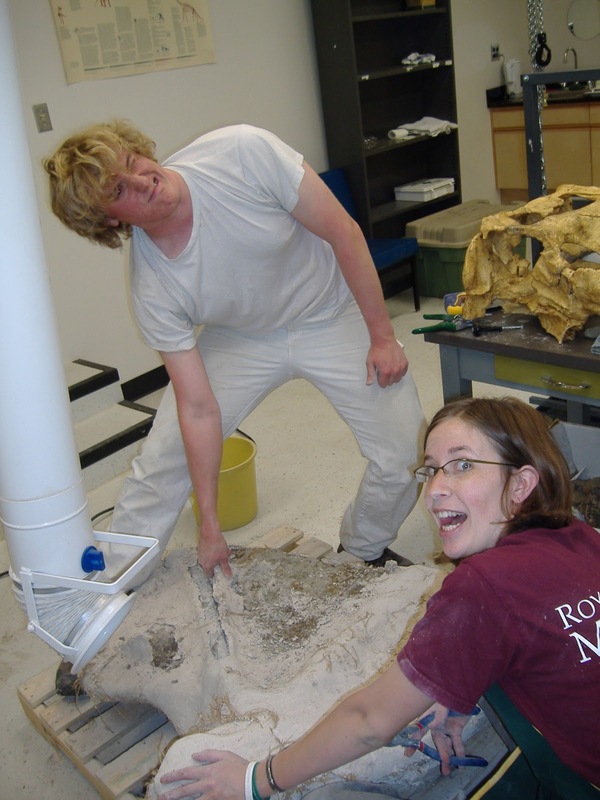 Hop in the wayback machine, here’s a picture from 2007, my first year at the U of A, working on the cervical half rings of UALVP 31. Preparing the material took a couple of years, because I did it in bits and snags around my research and other projects. I had help from several of my fellow grad students and technicians – Robin Sissons did the scapula, Mike Burns and Kristina Barclay helped with the pelvis, and Ian Macdonald and Clive Coy assisted with some of the trickier parts like the poorly-preserved second cervical half ring. You guys, opening up old jackets is hard! Anyway, this is Mike and Robin in 2008 being awesome weirdos. In 2009, I decided to supervise two high school students in the University of Alberta’s WISEST Summer Research Program. WISEST (Women in Scholarship, Engineering, Science and Technology) is an awesome organization that organizes conferences for junior high and high school students, and supports grad students, postdocs, and early career professionals on campus. Their Summer Research Program places high school students into university labs for about 6 weeks during the summer, and by the end the students produce and present a poster discussing what they’ve been up to. 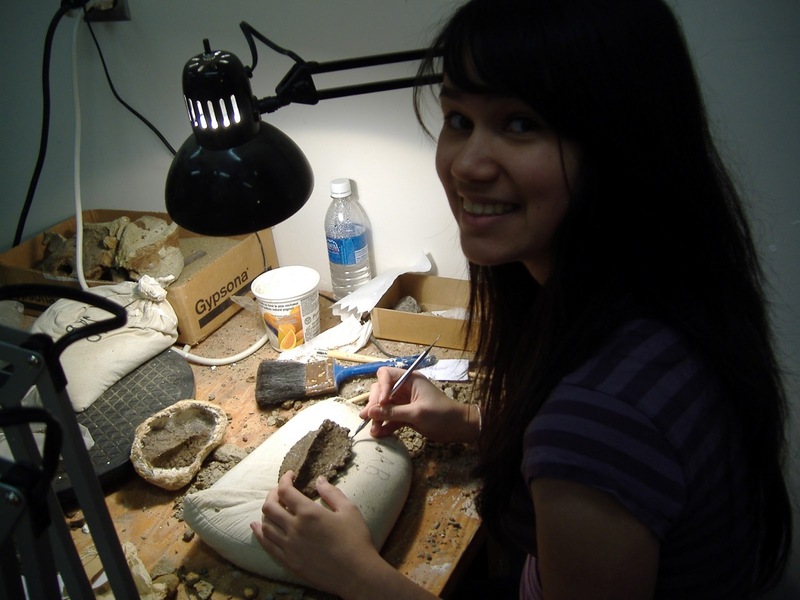 In 2009 I was joined by Carmen Chornell and Idel Riemer, who were enthusiastic and excellent fossil preparators! Together we completed preparing the UALVP 31 pelvis, as well as other small bits. 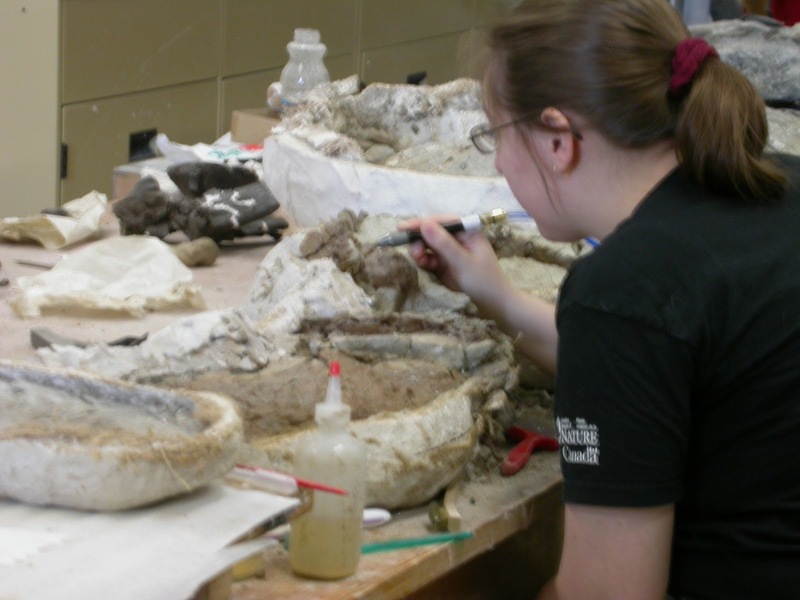 …while Idel puts the finishing touches on some osteoderms. The UALVP 31 cervical half ring turned out pretty neat, but I needed more information to figure out if the half ring of CMN 0210 was unique. I visited lots of museums to see what the half rings of other “Euoplocephalus” specimens looked like, and to see the half rings of other species of ankylosaurs. Thankfully, it seems that the half ring of CMN 0210 is diagnostic, so Euoplocephalus is a real taxon after all. The first cervical half ring has 6 tall, keeled osteoderms, and each pair has a distinct morphology. The middle (medial) pair are tall, with a centrally located apex to the keel. The lateral pair also have a keel, but it’s kind of sigmoidal (or, S-shaped). The distal pair, which cover the tips of the band, are flange-shaped. 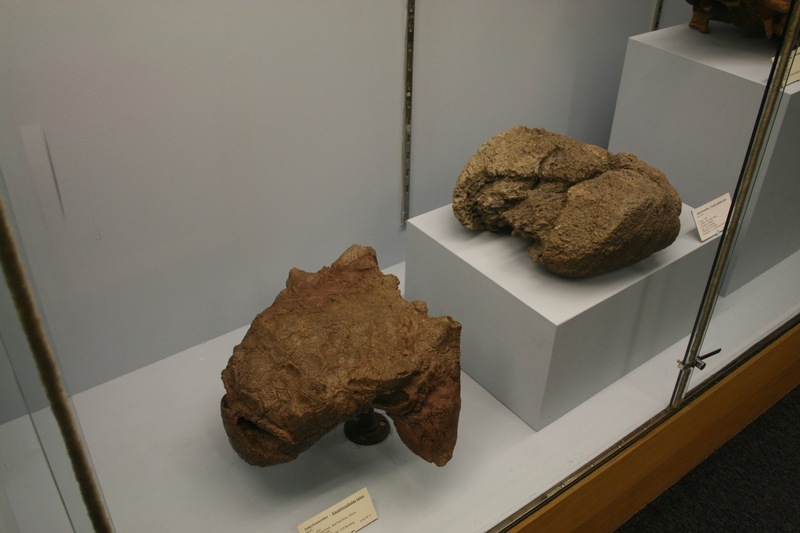 Some specimens, like UALVP 31, are missing the distal osteoderms – these don’t seem to fuse on as tightly, so it’s possible that they are more easily broken off before fossilization. 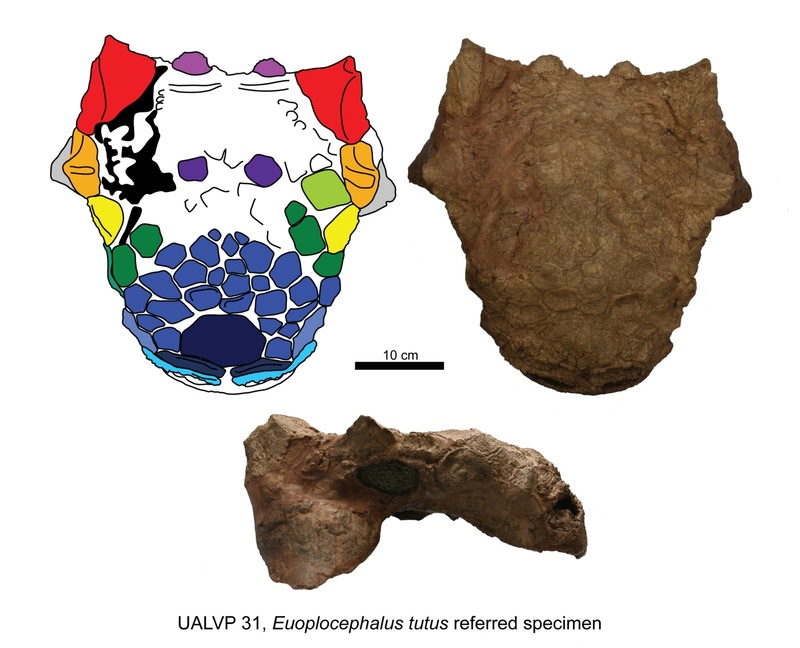 The half ring of UALVP 31 shares the same morphology as CMN 0210, and so UALVP 31 was one of the few specimens that I could confidently refer to Euoplocephalus for a long time (another being AMNH 5406). UALVP 31 was the only one of these that had a complete skull. On the left, CMN 0210, in the middle is UALVP 31, and on the right is AMNH 5406. In the next post, I’ll talk about figuring out variation in the cranial ornamentation in Euoplocephalus skulls. AND HERE ARE SOME PAPERS! Arbour VM, Currie PJ. 2013. 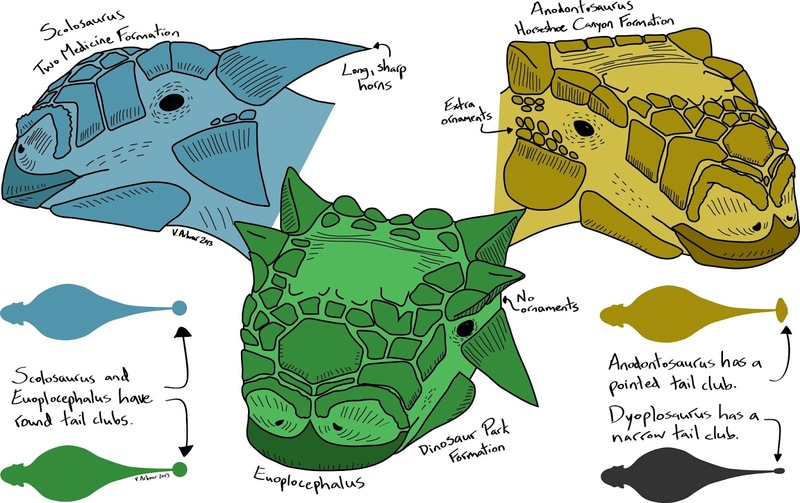 Euoplocephalus tutus and the diversity of ankylosaurid dinosaurs in the Late Cretaceous of Alberta, Canada, and Montana, USA. PLOS ONE 8: e62421. Brown B. 1908. The Ankylosauridae, a new family of armored dinosaurs from the Upper Cretaceous. Bulletin of the American Museum of Natural History 24:187–201. Gilmore CW. 1923. A new species of Corythosaurus with notes on other Belly River Dinosauria. Canadian Field Naturalist 37: 1–9. Lambe LM. 1902. New genera and species from the Belly River Series (mid-Cretaceous). Geological Survey of Canada Contributions to Canadian Palaeontology 3: 25–81. Lambe LM. 1910. Note on the parietal crest of Centrosaurus apertus and a proposed new generic name for Stereocephalus tutus. Ottawa Naturalist 14: 149–151. Penkalski P. 2001. Variation in specimens referred to Euoplocephalus tutus. In: Carpenter K (ed.) The Armored Dinosaurs. Bloomington: Indiana University Press, 363-385. Wilson JA, Upchurch P. 2003. A revision of Titanosaurus Lydekker (Dinosauria – Sauropoda), the first dinosaur genus with a “Gondwanan” distribution. Journal of Systematic Palaeontology 1:125-160. Today I published a revision of the North American ankylosaurid genus Euoplocephalus. I’d like to take some time to go through some of the major points of the paper over the next few days here, but today I will give a brief introduction to the motivation behind this study. Euoplocephalus is one of those ‘classic’ dinosaurs. Named in 1902 (as Stereocephalus, which was preoccupied by…a beetle! of course), it wasn’t known from very much material. All that Lambe had was a chunk of the snout/forehead region, and an unusual structure called a cervical half ring. Cervical half rings are totally bizarre structures that seem to be unique to ankylosaurids. They’re made of an underlying yoke of fused bone segments, and topped by fused osteoderms like you see on the rest of an ankylosaur’s body. Canadian Museum of Nature 0210, holotype of Euoplocephalus tutus. On the left, the skull chunk. On the right, the first cervical half ring. Images modified from Arbour and Currie (2013).